“I’ve gone to Dr. Longie for several years. I have lived in many different states and gone to chiropractors all over the country. I’ve never found a chiropractor as good as Dr. Longie. A Happy Patient in St Lucia! His name is Sunshine Biscuit. 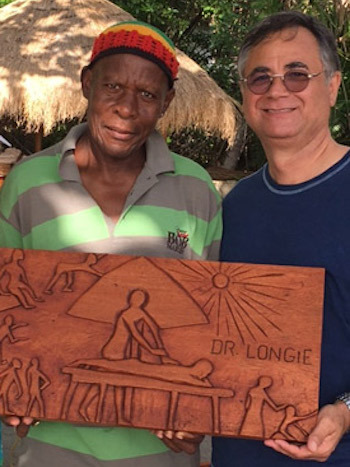 As a special thank you for fixing his lower back, he carved me this special St. Lucia Island Plaque. A Patient For 8 Years! “Dr. Longie and staff are very courteous, helpful, and friendly. They have been flexible and work with my busy schedule. Dr. Longie has adjusted me for the past 8 years and I have been very pleased with my overall service at Brentwood Advanced Chiropractic. I wouldn’t go anywhere else when I have Brentwood Advanced Chiropractic. “For years I have experienced pain in my lower back extending into my right hip joint, which caused problems in my right knee. Over the past few years I have had surgery three times on my right knee. In the spring of 2003 I was at the end of my rope and desperate for anything that might help me. I decided to visit Dr. Longie after I read an article about a little girl he had helped. “I have been experiencing headaches for as long as I can remember. After going to a primary care doctor in early 2000, I was told the headaches were due to a high caffeine intake and stress. They prescribed a medication and sent me on my way. Dr. Longie came to our office to do a lunch and learn in September of 2016. After hearing him speak about the benefits of chiropractic care, I decided I didn’t have anything to loose so I scheduled an appointment. 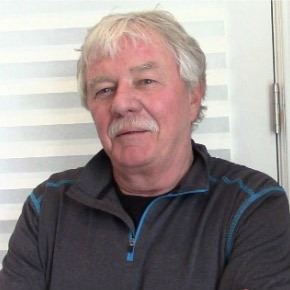 “I have been coming to Dr. Longie for about 4 years now. When I first started coming I could barely stand up straight. With his great help I am playing the sport I love again! I love Dr. Longie’s persistence in getting your problems under control. He also has an excellent office team! “I am a very active person. At the age of only 25 I was having some serious back problems. I was just tolerating them from day to day, the pain would come and go. I had been to Brentwood Advanced Chiropractic in the past for some quick fixes and stopped going when the pain was gone. However, as time passed my back pain for to the point where it was a struggle to even get through a day of work or do any of my physical activities. I was wearing a back brace and having to hold my breath to do certain things. I had enough and I knew Dr. Longie had helped me in the past, so I made an appointment and go in as soon as possible. After the first visit I felt so much tension release and majority of the pain leave. Since then I haven’t stopped going and I don’t see myself ever stopping. We invite you to contact our office today to find out how Dr. Longie can help you!